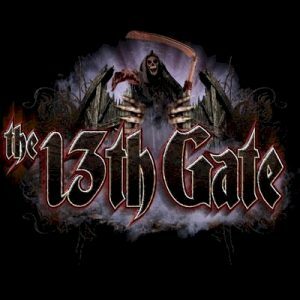 The 13th Gate is a Haunted Attraction located in Baton Rouge, LA. Team Giraffic Shark reviewed this Haunted Attraction on October 7, 2018. Team Giraffic Shark couldn’t stay away from THE 13TH GATE and had to return after their visit in 2017 to see all the changes and updates for 2018. Needless to say, there was no disappointment. 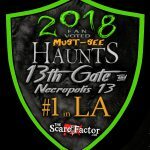 THE 13TH GATE now stands alone as a single haunted attraction, as they did not open NECROPOLIS 13 for 2018, and in its place is CARNEVIL entertainment zone (free to enter), with all kinds of games including three escape rooms, horror-themed carnival games, axe throwing, a heckling clown dunk tank, food, merchandise, live concerts on certain nights, and other entertainment. Our team was sad to not see NECROPOLIS 13 this year, having really enjoyed the unique attraction, but we are hopeful for what may lay ahead for the future of 13TH GATE. Having reduced to one full scale attraction, a HUGE amount of work went into 13TH GATE updating, changing, and bringing new content to life for its returning Guests, so even if you have been before, 13th GATE is NOT to be missed this year. Cast at 13TH GATE is always top notch, providing a backstory and delivering complex scares including pop scares along with follow-through, creepy scares. 13TH GATE is so thorough with their performer backstory that often it is difficult to decide whether to pause in a room to hear the script or continue walking and catch what you can. The cast outside the haunt, while creepy and providing occasional scares did not stay fully in character, largely due to the small crowd and lack of people to creep out or scare. 13TH GATE uses their actors to their best capability, placing them in locations and roles that they will thrive in, based on talent and/or typecasting. The 13TH GATE cast seeks opportunities to scare multiple times when possible, maximizing the scenic design and scene layouts to their advantage. 13TH GATE clearly spends a great deal of time and money on their detailed costumes, makeup, and masks. Masks, when used, are perfectly placed and themed, with exquisite detail and realistic features. The only less-than-perfect masks were the prosthetic/masks of the Wicked Witch of the West in the outdoor scene (some tearing/separating was occurring), and some of the Pennywise masks were having some hair challenges. These notes, however, are among hundreds of phenomenal masks and detailed makeup applications done perfectly. Nearly all costumes appeared to be custom designed, built, and purchased for 13TH GATE, as the details and textures are extremely unique and something that can’t be purchased from any regular costume vendor or cosplay-style artists. Customer Service was great at 13TH GATE, from the lady at the ticket booth who sold us on a combo ticket (while not being pushy) to all the employees at the CARNEVIL (including the young ladies working the VR and Escape Game attractions, helping us decide which ones to do). There was a pleasant young lady at the exit of the attraction who talked to us prior to entering, as well as upon exiting, and wanted to hear what we thought, and discuss our favorite parts, etc. She was very friendly and eager to hear about Guests’ experiences immediately upon leaving the attraction, without even knowing that we were a review team. 13TH GATE sits right on a street corner in a warehouse district, with an entirely black building, and the carnival-themed CARNEVIL across the street is built somewhat from shipping containers but somehow fits in with the warehouse theme. With the amount of detail inside 13TH GATE, it seems as though there must be some sort of city ordinance preventing the creative minds of 13TH GATE from giving their building a phenomenal façade to match the attraction inside. However, upon nightfall, when spooky characters emerge from the shadows, and lights/effects are turned on, it is apparent that this is, indeed, the location of a haunted attraction. Rather than buying the newest item at Transworld, and finding a place to incorporate it into their attraction, the creative minds at 13TH GATE clearly do their research, but then take these types of effects and ideas to the next level, making custom creations and effects not seen anywhere else. These effects match so well to their scenes and themes that they blend in perfectly, and even if the ideas have been purchased from a vendor or were seen at the convention, they are perfectly integrated into the landscape and made custom for 13TH GATE’s use. The only exception is the animatronic figure in the final scene of the haunt, which seems to be a somewhat last minute add, with a visible trigger sensor and a very “off the shelf” ending to an otherwise extremely original and creative attraction. Everything is just so perfected at 13TH GATE, especially in the scenes that have returned from previous years. Sound is programmed just perfectly including background along with triggered effects. The white noise faux-silence works so well in the attraction between the loud scenes. Similarly, lighting is very well done, highlighting the details, while leaving many shadows, mystery, and suspense in every scene. 13TH GATE has something to scare everyone, whether it’s clowns, snakes, spiders, darkness, enclosed spaces, or the cost of incredibly detailed beautiful scenic design. Did I mention this attraction is beautiful to look at, and it’s a shame most of it is spent scurrying through rooms in near darkness? Similar to the amazing details, every scare is perfectly laid out and designed for maximum impact, with scares designed to keep Guests guessing, as they are unpredictable, random, and each unique from the other. Performer scares as well as special effect scares are equally effective, and balanced very well so there is no need to rely on one more heavily than the other. Special effect scares are themed, and well-placed among the various scenes as well, showing that extreme thought went into making sure everything fits within the stories of the scenes. 13TH GATE still stands as one of the most intense, pulse-pounding experiences this team has experienced. 13TH GATE is priced very reasonably for a haunt of its length (about 26 1/2 minutes) and quality. The employee at the ticket booth sold us on the combo ticket including the main attraction, axe throwing, a virtual reality experience, and an escape game, all for 40 dollars, a slight upcharge from the single attraction ticket of 30 dollars. By the time we did all of the attractions at CARNEVIL and crossed the street for the main attraction, there was hardly a line, making for a fun-filled, yet efficient evening. 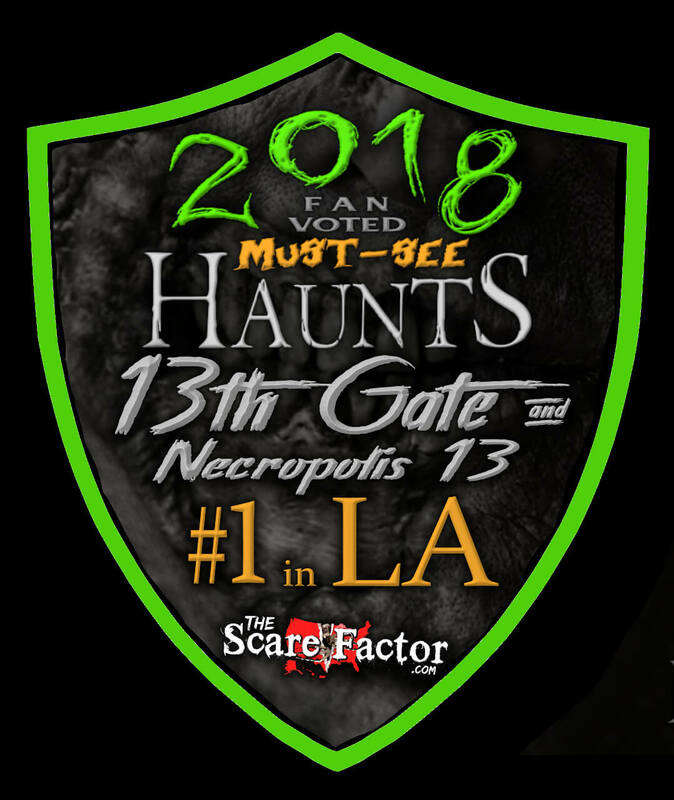 13TH GATE is also partnering with Dr. Pepper, offering a $5 discount on general admission (not applicable to the combo deal), as well as an offer with other local attractions, featuring upgrades (VIP line access) and free general admission at certain other Louisiana haunts (see haunts for details).